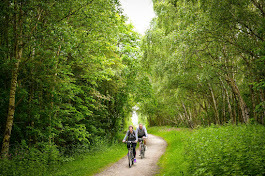 Hope you are all well and able to get out and about on our network of paths and trails. With the emergence of spring and the current good weather, we will obviously begin to see an increase in the users of the NCN. This is a request for your support... If you are out and notice any signage that is damaged, missing, moved or a certain trail could benefit from the addition of some new signs... could you please let me know? Please email me with any location details and if possible include pictures. If any issues can be tackled with temporary sticker signage, I'll be out over the coming weeks with some of the stock of signage that I hold. If it is signage that needs to be ordered or are of a more permanent nature, I'll pass the information onto the relevant departments or council contacts.